Story of a young lady (19), who benefited from the emergency fund. | Ärzte für Madagaskar e.V. Story of a young lady (19), who benefited from the emergency fund. Dr med Heuric Rakotomalala, lead surgeon at Hopitaly SALFA Manambaro, tells us the story of a young lady (19), who benefited from the emergency fund. The young lady was having seizures and was comatose when she reached the hospital – plus she was eight months pregnant. It took 48 hours until she woke from the coma. The family could not afford to pay the treatment costs of about 100 Euro. To pay for at least part of the hospital bill, the family sold their last cow. The remaining costs were covered by the Doctors for Madagascar emergency fund. 80% of Madagascans live in extreme poverty. As there is no universal health insurance, Doctors for Madagascar covers the medical costs for patients who otherwise could not afford medical care. Doctors for Madagascar organises regular aid missions with volunteer doctors and medical staff from Europe. These volunteers treat patients directly and also provide training for local staff. Southern Madagascar urgently needs qualified medical personnel. Our project "Skills to Save Lives" provides medical training for doctors, nurses and technical staff in one of the poorest areas of the country. Pregnant women with severe labour complications often only reach a clinic after traveling for hours on an oxcart – with serious consequences for them and their child. Most have no access to pre-natal care. Doctors for Madagascar is working to improve care for pregnant women and newborns. In Madagascar, patients are generally fed and cared for by their families. So that food shortages don't get in the way of treatment, Doctors for Madagascar covers the subsistence costs of all in-patients in our partner hospitals. Many hospital buildings and health centres in Madagascar are in a desperate state, with no money for even the simplest repairs. Doctors for Madagascar supports hospitals and health centres to build and renovate essential facilities. Kept in good condition, hospital equipment saves lives. But extreme climates, inconsistent electricity and inadequate maintenance in Africa wear out medical equipment much faster than in the UK. We provide not only medical equipment, but also training on maintenance and care. The Junges Ensemble Berlin, one of Germany’s leading youth orchestras, bewitched its audience with Beethoven’s masterful violin concerto and Prokofiev’s fiery Fifth Symphony. What an evening at the Berlin Philharmonic! Since 2012, Doctors for Madagascar has been an NGO partner at Praxis Update, a continuing medical education conference for GPs. Today a mother came into the hospital carrying a baby – one week old with ashen skin and a belly distended like a barrel. For a long time, relatives cooked meals for patients on traditional open fires in the wasteland outside the hospital site. April 2012: Sweaty and shivering with exertion, two oxen drag a heavily laden cart the last few metres to Fotadrevo hospital. The passenger, Tiana, has a 40°C fever and is nine months pregnant. Financing an aid mission yourself? Yes, it’s possible - Johannes Häußermann is the proof, with his crowdfunding drive "An Engineer for Madagascar". Developing countries have seen dramatic improvements in many areas over the last 15 years. How to explain Madagascar’s low HIV/AIDS rate? 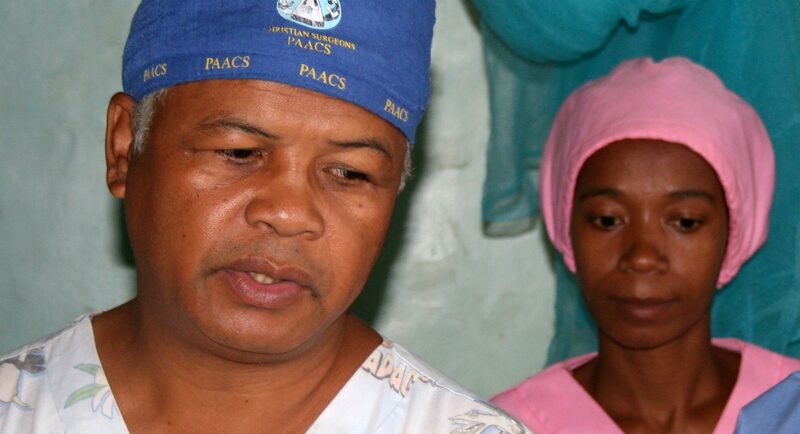 Madagascar stands apart from sub-Saharan African nations with regard to HIV/AIDS rates. Why? The sun burns hot on 7th December 2012. One of Médecins Sans Frontières’ white 4x4s pulls into the gate of the hospital in Fotadrevo, carrying three women from the town of Bekily, 60 km away. Nine hours’ worth of parched land pass by our 4x4 as we travel from Toliara to Fotadrevo. Cacti, shrubs, scant trees and now and then a village of mud huts. Sand and dust reach as far as the eye can see, in shades of red, brown and grey.